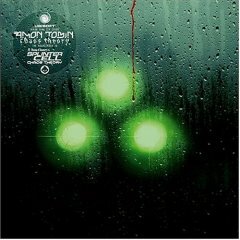 Amon Tobin - "Chaos Theory"
Beginning to enjoy the spacier and psychier types of electronica in the mid-'90s, I always felt like I'd but scratched the surface in discovering the multitudes of music coming from the global electro-revolution. During the last few years I've felt even more out of the loop as it were, but picking up this (fairly recent) release from Amon "Adonai Santos de Araujo" Tobin indicates that there's still exciting new innovations going on. The subtitle is "Soundtrack/In-Game Music to Tom Clancy's Splinter Cell 3", and while this, the track-titles and cover art are evocative, natch I can only report the experience of the music on its own. It's quite a sound, mean but clean, often brutal, always intense, highly-percussive thrashing of millenial proportions. There were vital studio sessions with several key players, particularly drummers Fausto Bava and Giuseppi Guerra, and bassist "Nacho" Mendez, all of which in post-production mix-down is manipulated by AT's masterful backwards/forwards time-glitch cut-up trickery (or you could call it an approach to "drum'n'bass"), and layers of synth/keys, all delivered in regally dark symphonic high-drama brood-mood. "The Lighthouse" opens with ominous cello, bells, bass-line and fx before exploding into a tight fury of wild everywhere drum thrashing astoundingly held together, electronic bass creating a subtle undertone. "Ruthless" (and it's less percussive reprise) utilizes a locomotive-bell motif, heavy bass riff and more of the devastating full-on-percussion cut-ups; note the airy resonance in the cymbals. (I guess I could say "jazz" at any time, but it'd be like mentioning "the blues" while writing on a rock'n'roll album.) "Kokubo Sosho Stealth" works a brooding hip-hop shuffle-beat, creepy space-keys, wah-guitar; it's reprise "Battle" is a sped-up assault with frenetic tribal hand-percussion. "El Cargo" - more trippy-hop heavy drum grooves, pulsing synth, ghostly wails, flutes, plinks, tinny bells, the ever-present electronic washes. "Hokkaido" is the penultimate track, creeped-out warbling flute and strings (courtesy of "Canhoto Philharmonic Orch"). The finale work-out "Clean-Up" builds yet more epic tension till bursting out with the ultimate drum/percussion storm to end 'em all and end 'em all. A singular sound. Right on!